Czech organist and composer Irena Kosíková will give organ recital on Sunday 1st November 2009, 5pm, at the Church of St. Petr and Pavel in Polešovice. She will premiere her organ composition Funambule I. (2009). 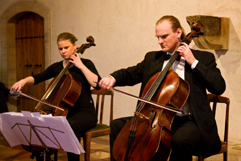 On the concert you can hear works of Antonín Dvořák, Irena Kosíková and Johann Sebastian Bach. Concert is organized by Film club Polešovice as part of Sunday concert series in Polešovice. For more details visit websites http://www.iKosik.com and http://www.Polesovice.cz . 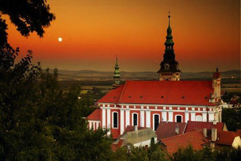 Where was born "Terezín" composer James Simon? Contest is over, fastest winners are: Wyfiko and L. M. from Polešovice. Kult.cz is media partner of projects "Weinberger Tour", "Duo Brikcius - 2 Cellos Tour", "MAKANNA" & "eSACHERe". German composer, pianist and musicologist James Simon (September 29th, 1880 - August 12th 1944, the date of his deportation from Theriesienstadt to Auschwitz) was born into the Jewish family in Berlin and murdered in Auschwitz in 1944 after the Theriesienstadt experience (1941-1944). He studied at the Musikhochschule in Berlin piano (C. Ansorge) and composition (Max Bruch). In 1934 he was forced to leave Germany to Zurich, later Amsterdam where he was arrested and deported to Theriesienstadt. 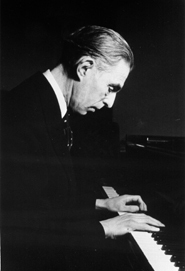 While some of Simon's piano pieces, songs and his opera "Frau im Stein" (1918) were published, lot of his great compositions are still remaining unperformed. He is called "Lost Composer". James Simon is in 1938 leaving to visit his sister Bertha Seligsohn (1882 - 4 February 1938, Tel Aviv) to former Palestine, after his arrival he learned his sister had died. Because of his sorrow he wrote in two day Lamento for Cello and Piano dedicated to his brother in law. James' relatives tried to convince him to stay among them and settle in Palestine but he chose to return to Amsterdam where he has already re-established himself as an active musician and where he felt safe. It was fatal decision. 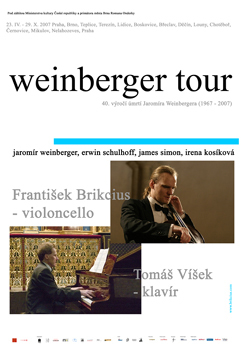 James Simon's Lamento was in Czech Republic premiered by Czech cellist František Brikcius and pianist Tomáš Víšek as part of project "Weinberger Tour" on 23rd April 2007 in Spanish Synagogue in Prague. 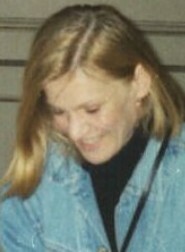 For more information about James Simon go to http://www.Brikcius.com and http://En.Wikipedia.org/Wiki/James_Simon_(composer) .